It is a nightmarish experience in an unknown world. You are given a name. You are living a life in the game. 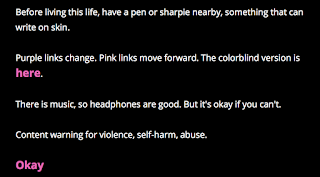 In a world that is full of self-harm, abuse, and violence. You were asked to get works for a monstrous empress. Her abdomen is swollen, and she smells like dead candy. Like a monster. You had a chance to explore into the field. In the palace, there are balcony, chambers, garden, workshop, and city. You could explore into those places, but you would find you are returned to the palace again and again. You are isolated, waiting to be noticed, waiting for something to happen. Then you had to sleep in your chambers to advance the process. You got messages. You get works to do. You were employed by the empress to do works for her, such as making a gift for the ceremony or designing a weapon for her, although these tasks seemed to make no sense. The empress hunted people. Everyone was fearful to be the victims so they did not dare to question the custom. It is a dream of trauma. You went through it. During the adventure, I was asked to draw sigils on my skin of: New beginnings, Relationship with the chasm, Shame, Insight, Influencing this outcome, Pain, Severing, A thought loop, and what I feel. Those sigils are like imprinting about what I suffered and experienced. Tangible and compelling. This interaction process really is a distinct feature of this E-lit piece. Drawing sigils as a part of the gameplay is an impressive interaction for me. Physically. The influence is really profound. Sigils that readers draw on their skin represent their emotional symbols. Check out here for sigils. You will see various kinds of sigils that people draw. Like a exposure of what inner traumas they have. They are physical remarks of what violence and trauma bring to us. A question is asked if we are part of the world or alone. Does being part of the world with others mean conniving the society full of abusing? I am not sure, but in this world I think it does. If we choose to be part of the world, we would participate in the eradication of the princess-spores, put them to death. We would be merciful if we choose to be alone and separated from others. In this mundanely monstrous world, You work for the cruel empress. She has supreme power in her field. “Power is wounded by anything that refuses to be destroyed by it”. If we choose to be apart, we are the ones that were not destroyed by power. In the note of this piece, the author writes: “Punishment isn’t for people who do bad things. Punishment is an energy that flows toward the weak, predictable as water. Punishment happens to those who cannot stop it from happening.” Then the result would be that those who fail to question the bad things get the punishment. Like the following picture shows. She comes. Sedina, with whom You hate the world together. You have most of the conversations with her in this game. She is considered as the representative of hope in some ways, but it is she that told you that “hope is a shameful thing”. I have a personal estimation that maybe she is another me. She came to remind me of hope in this dark world. She reminds me of my bravery to get over my trauma. Recover. And get energized. Sedina, so as “I”, see this place clearly. We are not what we choose to be. We are trapped and we have no power. This point also is conveyed in the playing procedure. With many only one-choice hypertexts, we seemed to follow a fixed path of life. We are pushed to move forward. We have no choice. Sedina has scars on her appearance. She said: “What they did to me on the outside, they did to you on inside”. It sounds like the trauma that they did to “me” is inner and spiritual. The trauma is very deep. Porpentine states: “In most media there’s an unspoken belief that feminine lifeforms can’t survive on their own, can’t have spaces of their own, can’t have relationships of their own. I try to go against this with basically everything I make.” We can survive through those traumas. My favorite part of the game (also the most confusing part) is about distilling the dreams of children. “My” (the character’s) mother gave “me” a cup to drink and “I” will no long dream. Is it another type of adult abuse? When children lose their ability to dream, they lose innocence. They are forced to grow. I kind of feel that way. It is vague to tell but also have connections with previous contents. It is a ritual, at least to my estimation. Like the ceremony of empress, like the re-applying process of hormone. “She gave you the cup. You drank it, because she was your mother.” Very customary like a routine in your life. Living in a world full of abuse, violence, and harms, “every day is damage”. That is the main theme in the world of “With Those We Love Alive”. It calls back some dark old days of the players. Anyway, a very impressive game. With Those We Alive. How do you come up with a title so beautiful yet so daunting? Before reading the piece and getting to know what it is about, the title got me thinking about what we perceive about those who are dead and those that are living. I can not speak for others, but whenever I do a project or write about someone based on a specific topic, I would usually choose a family member that has passed on. I would dedicate this piece of work to them and they would never receive them. I would never think to dedicate a piece to those that are alive and I love very much. I am taking their companionship for granted. When they leave me, I will dedicate poems, stories, and handmade jewelry to them and they will never receive it. I am making something in honor of my two passed relatives and the title actually made me stop and think about the reason why I am making these things for them or in honor of them. It got me thinking really deeply and taking me to uncomfortable places I’ve been neglecting these past few years. The title got really got me….. The first few “pages” where the reader had the choice of selecting the birth month, eye color and element reminded me of those Tumblr posts where your birth month and birthday indicated that you were a character based on the premise of the chart. In this elit, you have the choice of choosing your birth month, element and eye color which will generate a name for your journey. The first time I did this I was an artificer, but I wanted to know if picking a different birth month, element or eye color would change what my ‘talents’ were or if it would my change my journey in the palace. I read and I was very confused about the author’s intention. I read it again after reading the statement and I still struggled to find the connections between her intentions and the elit. So I am curious about what others think about the piece. 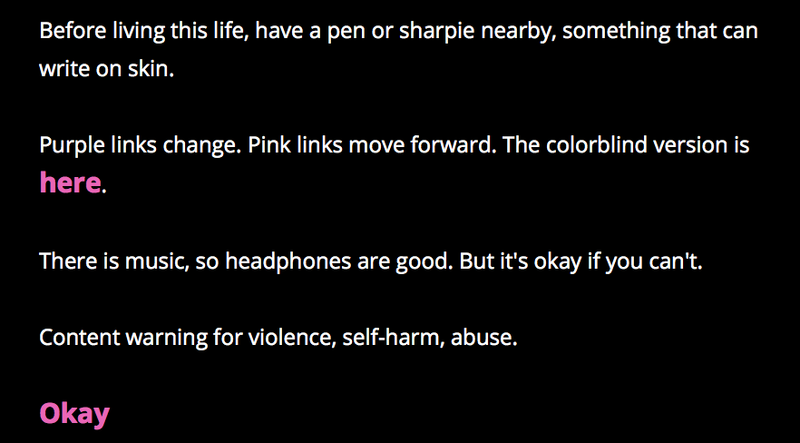 “With Those We Love Alive” is a Twine game designed by Porpentine Charity Hearscape. During the game, it interacts with the readers by inviting them to mark up their own body with symbols. It starts with making the readers embedded into the game and became the main character in the game. To be honest, I was really confused about how to continue and play the game. I spent some time figuring out the design and intention of the author and how to move forward in the game, during which I felt the game was kind of dark and horrifying. Then, when I reached the stage below. I started to understand the game and feel the emotion and meaning behind. I felt the despair and helplessness of the character being trapped. My understanding was that the character was kind of divisive. “The people who share your blood” is actually “yourself”, the old “you”. “Let it flutter away” is a part of “destroying the physical reminders of the past”, which is a way of “loving yourself”. In my own experience, if I want to forget something makes me unhappy, I would try to get rid of anything that may reminds me of that bad memory. I guess the most of us do the same. Therefore, here, the old “you” and the past is something “you” want to forget. There must be some reason, such as something bad happened in the past, that makes the past and the old “you” terrible for “you”. However, the behavior of drawing signs on the skin that is required in the game reminds me a lot of self-harm. I don’t want to admit that, but I had done this before in my middle school. That time is really the darkest period in my life, during which I self-harmed using knife and compasses. I tried to avoid these things and memories after graduating from middle school, but this game really reminds me of that. For me, that old me in the middle school is also something I want to forget and get rid of. Here, I am the same. We are the same, Jangloss. It did make me feel kind of uncomfortable, so I gave up doing that halfway, which is a part of “loving myself”. Let me start off by saying that a lot of things have happened in the past, hmm, say… week or so (you can ignore those links, they’re just to an album that dropped that I’d like to just kinda document because it’s emotional and beautiful and relatable and I’m overwhelmed–), soooooo… anyway, catch this post not being long and not being fantastic. Let’s make it short and sweet, shall we? Unlike the piece we read this week. With Those We Love Alive. (BOOM, segue.) That was not short, and it’s debatable how sweet it was, despite lurid descriptions. … I was endeared. The language itself just suggested a depth to this piece I didn’t expect. “Before living this life.” Huh. From there I had a feeling I’d be going about someone’s–not my–daily life. Then there’s the thing with the pen/sharpie? To write on skin? I was skeptical at first, so I didn’t grab a pen until about the third sigil that was asked of me. It felt strange, doing what this story was telling me. Asking for a response that would, could, never affect it. I may have subtly drawn a ghost of a sigil the first two times with my finger before I succumbed to just grabbing this screeching owl pen I have, but no one needs to know that. So that in itself was almost exasperatingly endearing. The power that the game had over me based solely on curiosity and amusement. Or maybe it was more than that. Color me surprised, then, when I found a link to Porpentine’s tumblr page at the end of the story/game with pictures of other readers’/players’ sigils. Gave me a sense of community that I can appreciate. Also, wow people are good artists. I just scribbled. But I guess those scribbles mean something to me, so they’re like… deep scribbles. Real emo scribbles. Important(?) scribbles. I’m ashamed to say I didn’t read the description before diving right into the story/game. I’m almost glad I did, so I was able to experience it blind. But lemme just post it here, because, again, I’m endeared. With Those We Love Alive is weirdfem dark fantasy where you design artifacts for a skull empress. It was made in Twine. Sometimes you draw on yourself with marker. It’s inspired by mob violence, trash struggle, C-PTSD, and child abuse. It’s also inspired by friendship between trash girls. In most media there’s an unspoken belief that feminine lifeforms can’t survive on their own, can’t have spaces of their own, can’t have relationships of their own. I try to go against this with basically everything I make. You had me at weirdfem dark fantasy. I was so pleasantly surprised when, reading it blind, I suddenly had a witch girlfriend. Thank you, Porpentine. I’ll protect Sedina with my Entire Life. Was it explicitly stated that the main character (aka You-but-not-really, Haze) was female? I mean, yes, the description says the focus is on feminine lifeforms, and yes, there were some stereotypically “feminine” traits to them (my brain only remembers the dress Sedina complimented *blush blush uwu*). Regardless, I love that kind of neutrality in pieces like this. Makes it easy to fall into the role of the character because, well, they’re you, no matter who you are. Firstly, the unconventional adjectives. I LOVE them. “The always weapons and the sometimes screams.” I love that kinda stuff. I don’t know how to describe why. Then there’s that last line. Oof. Hoo boy. Wowie. Ain’t that too real. There’s a story I want to write that kind of goes along with it. I’d like to share it one day, if it ever gets written. But yeah! On that happy note, I’ll go. Thank you for reading! And definitely play this game/read this story yourself. It’s a treat. Also, I still have faded sigil marks on my arm. I’m gonna wear them proudly. Before I dive into my thoughts and reflection about this piece, I want to have a little “Confession Corner” for part of my blog post. It’s something different, and I have never done it before, but here it goes. The first words I saw on the screen when I clicked “Begin” were the words, “Remember, nothing you can do is wrong.” I teared up and drew a blank at the screen for a few minutes. As someone who is a still recovering victim of depression, I knew that this piece would probably trigger a lot of past emotions. During that time, my inner self always made me believe that EVERYTHING I did was wrong. Ironically the complete opposite of the beginning of this piece. I am very hard on myself, and the smallest mistake would drive me over the edge. But I never stopped and allowed myself to breathe. I never stopped and said to myself, “Nothing you can do is wrong.” Reading pieces such as this and allows me to reflect about myself, it makes me think about my own writing. Anyway, enough of that. Porpentine Charity Heartscape is the author of this piece, while composer Brenda Neotenomie scored the music, which was just as beautiful as the words from Heartscape. As I previously stated, the opening line of “Remember, nothing you can do is wrong” really captured my attention. However, before that on the disclaimer page, it stated, “Before living this life, have a pen or sharpie nearby, something that can write on skin” (Porpentine). Just to touch upon this briefly, I found this to be interesting was not because of the pen and sharpie but “before living this life.” Which life? Whose life? I had too many questions for this opening line. This was the first part of the meditation page. These were the different options for the breathing techniques. Breathing is very underrated when it comes to staying calm and allowing yourself to realize certain things. Sometimes, all we have to do is breathe. This was the page that had “Holding my breath.” It also “I need different breaths” and also the word “Stop.” The word “Stop” meant to go back to the other pages and stop the mediation. However, I think there was something symbolic and subliminal that the author was trying to tell us about this character. 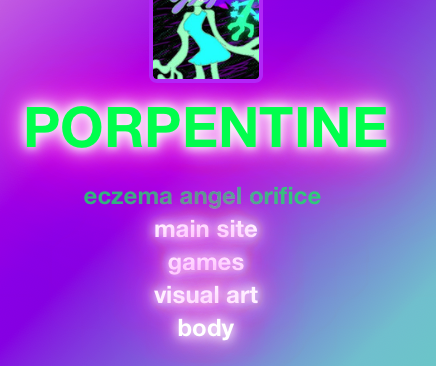 With Those We Love Alive by “Porpentine” Charity Heartscape is a Twine Game created in 2014. The piece begins with a left-pointing angle bracket and a number 3, more commonly known as the original heart emoji. A couple of screens later, a message displays that is obviously meant to reassure the audience: “Please remember: nothing you can do is wrong.” The author begins her story by assuring her audience can do no wrong. However, the story very quickly takes a mysterious and dark turn. This reassurance was warranted. This story is filled with people and objects that make the reader question where, exactly, they are. After exploring, there is a queen who rises out of slime and muck after completing her larval stage. Her doting followers licking the filth off of her skin. The reader is dismissed until further notice. After exploring, there are dead creatures everywhere, including a dead person that is sitting and swinging their legs on the balcony. There are all manner of creepy hybrid creatures in the canal. In the temple, there are jars of ancient arms and hands suspended in green fluid, which are covered in sigils. These items and more lead to a remarkably creepy atmosphere. Heartscape wants her audience to do more than just experience this story. She wants them to own it, to make it theirs. By asking readers to draw on themselves as the story progresses, she is essentially “branding” them. She also wants her readers to own their decisions within the story, because in life you cannot undo what has been done. The initial summary that I read before starting the reading mentions that this story is related to self-harm. I feel as if asking readers to write on themselves brings attention to that issue. The author’s Tumblr page backs up this theory. Some people wrote their sigils on the back of their arms, hands, or legs. However, a large majority of people wrote their sigils on the inside of their wrists, or the inside of their forearm. Is it coincidence that this is also the place where people tend to cut themselves when performing self-harm? I think not. However, thankfully, I did not notice scars from the pictures that were available. I never performed an act of self-harm, but I have a close friend that has struggled with her demons for many years. The dark, grotesque nature of this piece can relate to the dark, lonely feeling of someone who self-harms. “Why don’t you come home?” It asks. Your choices of answers are only, “Paralyzing Anger” or “Unbearable Longing.” It continues, “We miss our -” However, the letter doesn’t finish as Azidet is expected to release it to the wind or bury it in a chest in the bedroom. To me, this signals that Azidet is no longer living, and has thus committed suicide. I do have one discussion question, though of course the entire post is only one opinion and of course up for debate.But is there a significance to pink/purple contrast? Why did the author use those colors if she was going to have to go through the trouble of making a color-blind version? Does it have anything to do with the author’s tumblr account? High Muck a Muck is an interactive poem which reveals feelings and living conditions of Chinese immigrants in Canada. It creatively combines images, music, videos, texts, and audio files to present the poem. This poem is created by a group of artists. I will do a walk-through of this poem collection (as a Chinese now studying in America :D). This is the starting page of this poem. In the middle is a block of Chinese characters. In fact, these characters belong to the beginning part of Qianziwen (also known as the Thousand Character Classic). Qianziwen is a classical text covering many disciplines, which was used to teach children. If you are interested in Qianziwen, please go to this website, http://camcc.org/reading-group/qianziwen, to learn more about it. This website provides both Chinese and English versions of Qianziwen. Most of the translation on this website makes sense but I would like to give my own version of translation. Due to limited time, I will only translate the part that appears in High Muck a Muck. Notes: (1) The following Chinese characters may look different from those in the picture because of the difference between traditional Chinese and simplified Chinese. (2) There’s a beautiful rhyme if you read the text in Chinese. The sky is black, the earth is yellow. The universe is vast without boundaries and it has existed since the ancient times. The sun rises and falls, the moon becomes full and parsed. Stars spread in the vast universe. Summers and winters come and go, (and years pass). We harvest in autumns and store food in winters. Extra days form a leap year. We use music to adjust yin and yang. When clouds rise, they precipitate into raindrops. (When the temperature drops at night), dews condense into frost. The most precious fruits are plums and apples, the most important vegetables are mustards and gingers. Longshi, Huodi, Niaoguan, Renhuang, (they were officials and kings in the ancient times). The homepage is a traditional Chinese painting. Mountains and rivers consist parts of the human body. The blue dots are different places. They correspond to acupuncture points in traditional Chinese medicine. Seven places are involved in this poem, which are Canada, Victoria, Nelson, Vancouver, Richmond, Pacific Rim, Everywhere and Nowhere (you may feel confused before you enter this page, but later you will agree that this title is really a smart choice). The background music is played by a traditional Chinese instrument called xiao. This piece of music is a little gloomy. At the end of the music, new sounds appear, including people talking, the colliding sound of porcelain, children crying, and erhu playing. On hearing those sounds, you may feel that you are sitting in a traditional restaurant in China or in Chinatown. Canada is on the arm. Rivers are veins, and the blue acupuncture points are parts of the poem. Click the book on the left side, you can read the whole text. Click the person holding a telescope, the poem will be read in a video. The video combines the history of immigrants with calligraphy. The poem is titled “The Line (Pak Ah Pu, the Lottery)”. Pak Ah Pu (白鸽票）is a Chinese lottery game popular in the 19th century. The title corresponds to the starting page, “take a gamble and immigrate”. Immigration is kind of a gamble for Chinese because traditionally Chinese do not like to move. China is an agricultural country, which values settling down rather than moving around. There is a Chinese idiom called “安土重迁”, which means “live peacefully in hometown and easily move”. This idiom is used to describe nostalgia. This poem, “The Line (Pak Ah Pu, the Lottery)”, presents a typical Chinese character: a farmer, who respects the land and food, who values hometown and family, who is humble and may be good at cooking. However, in the picture, these farmers are standing beside a railway, which represents industry and modernization. In the video, the man hung upside down struggles in pain. These figures present the inner tension of these Chinese immigrants. Victoria is more lively than Canada. The background music becomes a little playful. The picture shows a Chinese neighborhood full of residents. Most of the buildings here are in traditional Chinese style. However, if you click the grey house on the top, a narrator called KL says that this neighborhood has nothing to do with modern China. It still sticks to the old Chinese style. Click the “Chinese Cemetry” on the right corner, KL also states that Chinatown is the only place for Chinese immigrants to make money because they are not allowed to work outside. Also, this is a place where people know and trust one another (they have to because this is the only thing they can do). Click the cowboy in the middle, CM says that no Chinese women are allowed to enter the club unless they are entertainers (Chinese women are secondary citizens). Click the person holding a telescope, you can watch an old movie which sets its scene in Chinatown but the main characters are not Asians (they are being racists). This Chinatown seems to be full of happiness but it is actually isolated from China and from Canada. Except for the old memories of China, the residents can only depend on each other. Nelson is a more desolate place. The background music is a little bit scary. This is not a nice place. Chinese immigrants are isolated from the local people. Anyone here can bully a Chinese. Click the telescope person, you can watch a video which includes many Chinese elements, abacus, smiling Chinese, mahjong, Chinese music, a doll with a coolie hat, Chinese opera, radio, screen, fingerprint. This video is a combination of modern and traditional elements. The background music can be divided into four parts. The first part is the whistle of the train, the second part is a Chinese song (might be a 70s style popular song), the third part is xiao playing, the fourth part is a combination of traffic and people’s steps. What happens here in Chinatown is globalization but other people do not understand Chinese culture. They simply do not care. Click the telescope person, you can watch an interesting video. The main characters in this video are a person wearing a coolie hat, and a doll wearing a coolie hat. They dress in ancient style and walk on modern streets. Tradition is being challenged by technology. The background music is very futuristic. The stories here are about new immigrants. Unlike the old immigrants who came here a long time ago (most of them are Cantonese speakers), the new immigrants come from PRC (which we consider the “new” China, which has a communist government). These new immigrants speak Mandarin. Many of them come here because they want their children to have a better education (This is true. Some of my middle school and high school classmates have come to North America for a better education. Now I am here, too). Many of them do not feel they belong to the Chinese society here. The telescope person here brings us a video about a dream. This is a dream of a new immigrant. He feels he belongs to nowhere. Only in his dream is there a place where he truly considers it a home (this home may come from his memory and will only survive in his memory). Three ships carry different stories. The ship on the left corner reminds me of a famous poem by Yu Guangzhong (余光中） called Xiangchou (Nostalgia). The following translation is done by me. My translation is simpler than that on the website. If you want to read a more literary and poetic translation, click the hyperlink above to learn more. My mother was on the other. My bride was on the other. The mainland is on the other. Yu Guangzhong immigrated from the mainland to Taiwan, yet he still had nostalgia, especially when his mother passed away. You can imagine how Chinese immigrants in Canada miss their hometowns. In Nelson, Chinese immigrants have their own grave area (because the locals do not want to share the cemetery with Chinese). But, even though they have graves, it is not enough. There is a Chinese idiom called “叶落归根”, literally means “the fallen leaves always return to the root”, the metaphoric meaning is “travelers always return to their hometown at last”. If a Chinese dies outside, his body will be carried to his hometown and buried. However, it was very difficult for an immigrant to carry the body back to China. Therefore, their nostalgia would last to their death. The ship in the middle carries a video. Sentences like “Made in China”, “Made in Japan”, “Made in Korea” form waves and national flags, meaning Asian commodities are sold to North America countries. Then Chinese music and western music combine with each other. At the end of the video, a group of people is sitting in the space, the earth is outside the window. The background music becomes something like electromagnetic interference wave in the space. The ship on the right side carries a poem about “mouthless anger”. This part is a combination of Taoism and Buddhism. In the middle is a taiji figure. Click it and then you will watch a video. At first, the video shows the eye of an old man. Finally, it becomes the eye of a baby. Chinese believe that humans have spirits. Their spirits can reincarnate. After one dies, he/she will cross a bridge in the underworld and drink Five Flavored Tea of Forgetfulness so that he/she will forget everything. Once one is reborn, he/she will not remember his/her former life and will live as a new person. Back to the Canada page, there is a corresponding part. Chinese worship ancestors and pray for help from their spirits. But what happens when their ancestors are reborn as new babies who have forgotten everything? What happens if their ancestors immigrated and never returned to their hometown? High Muck a Muck is an impressive work. It contains strong emotions and compelling facts. It is a work written for all Chinese immigrants around the world. It evokes both love for homeland and nostalgia. China is not only a geographic place, but also culture and memories. China is so far away on the other side of the Pacific Ocean; China is so close in the bottom of our hearts.